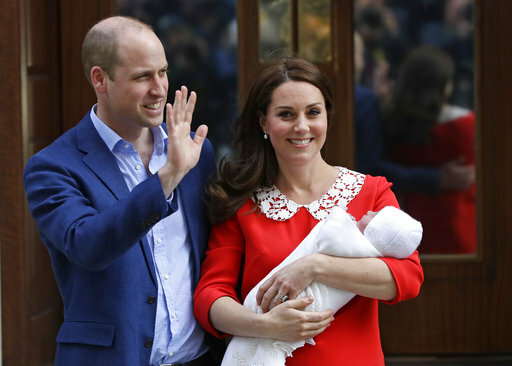 The top White House spokeswoman is offering encouragement to the Duchess of Cambridge and Prince William now that they are the parents of three children. 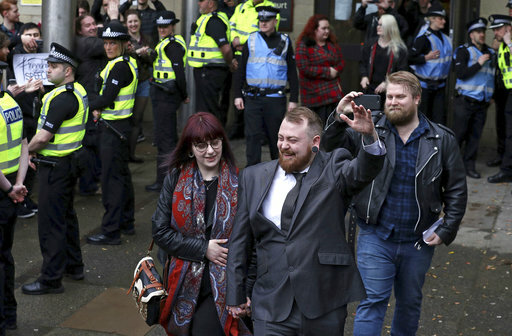 Press Secretary Sarah Huckabee Sanders congratulated the British royals during a White House briefing on Monday. 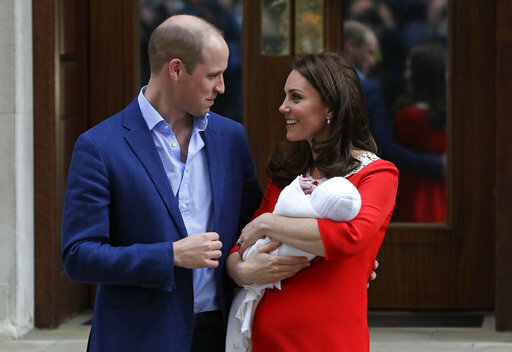 The duchess formerly known as Kate Middleton gave birth to a son on Monday morning, and left a London hospital in the early evening holding the fresh prince. 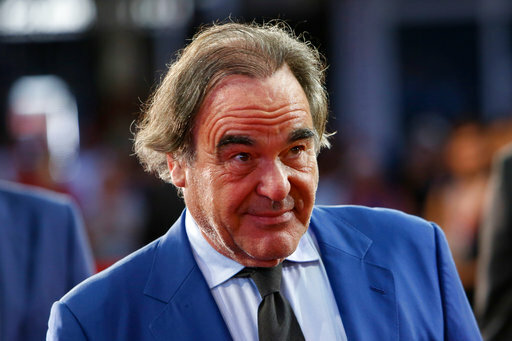 Sanders, who has three children herself, said: "From one mother to another, I know the reality of being outnumbered can be very scary, but I know she and Prince William will continue to be amazing parents." 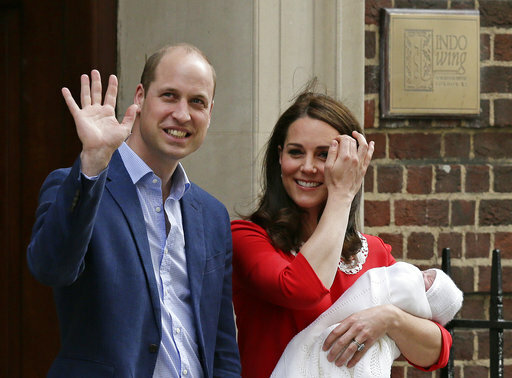 The Duchess of Cambridge and Prince William have left a London hospital and headed home with their newborn son. 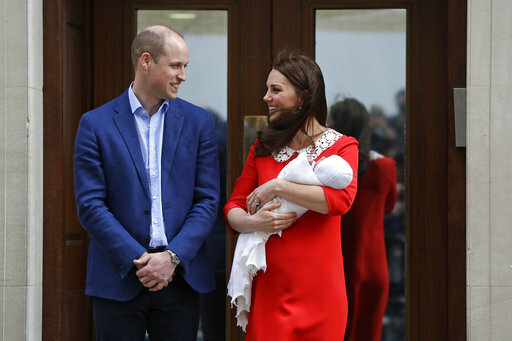 The duchess, who gave birth Monday morning, emerged from St. Mary's Hospital about seven hours later alongside her husband, holding the baby wrapped in a white blanket. 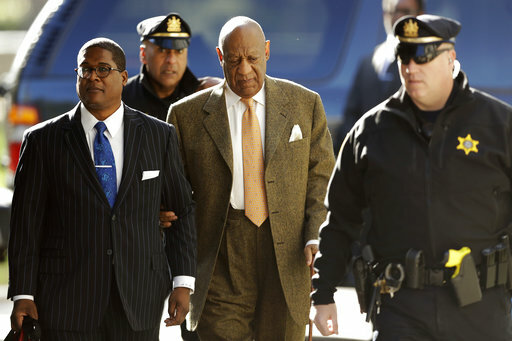 The trio posed for photographers before going back inside. 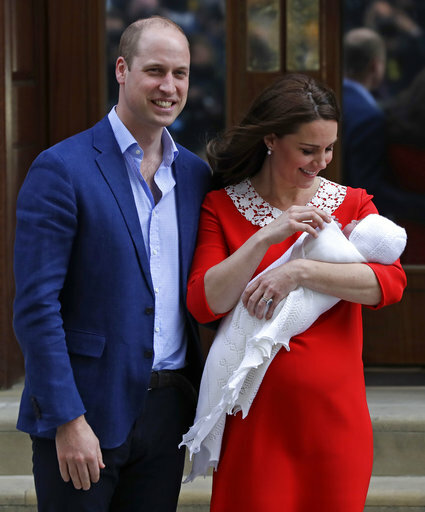 The royals emerged a few minutes later with their infant in a carrier and got into a waiting car. 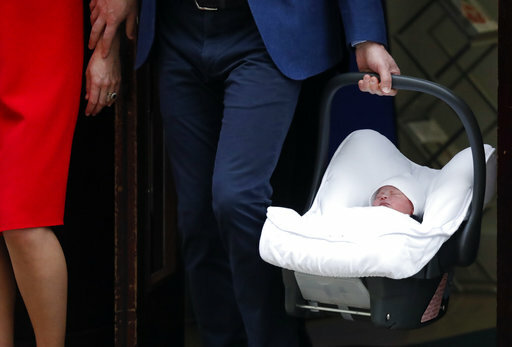 The newborn prince's elder siblings, Prince George and Princess Charlotte, already had gone home after a brief first meeting with their baby brother. 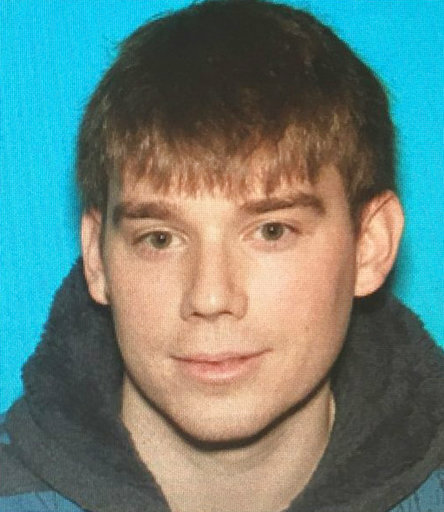 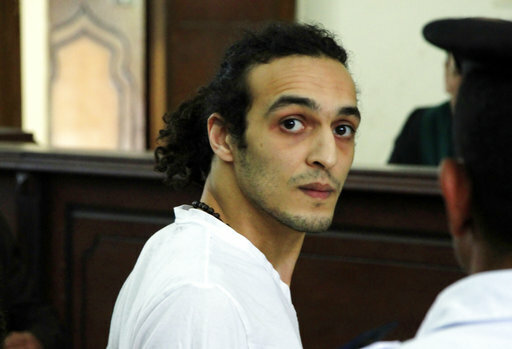 Royal officials say the baby weighed in at eight pounds, seven ounces (3.8 kilograms). 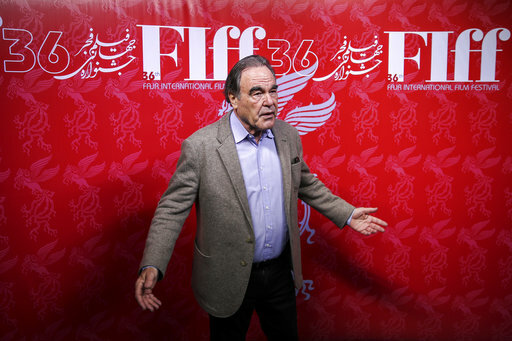 The prince, whose name has not been released, is fifth in line to the British throne. 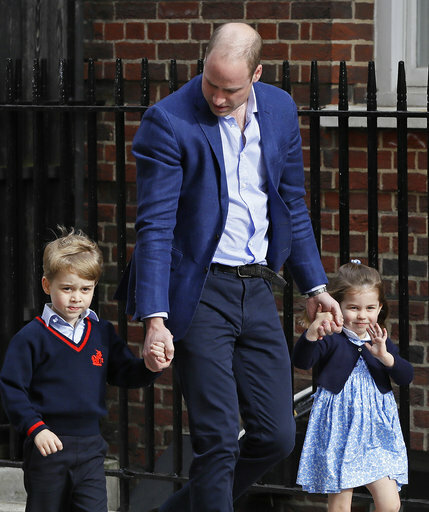 Prince George and Princess Charlotte have arrived at London's St. Mary's Hospital to meet their new baby brother. 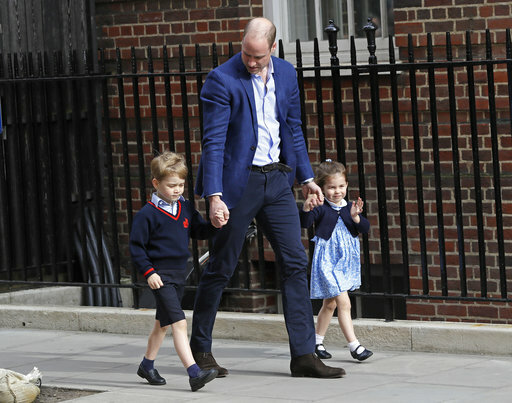 Prince William left the hospital Monday afternoon and returned half an hour later with his two elder children. 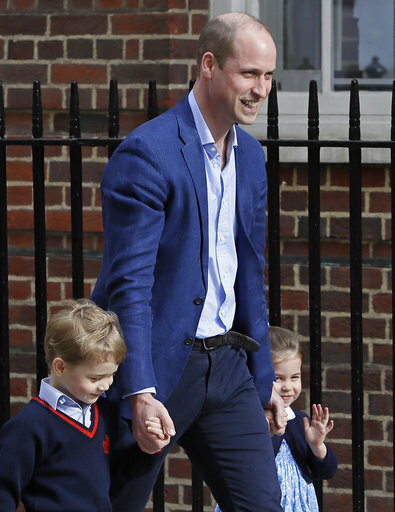 George, who is 4, wore the navy blue shorts and sweater of his school uniform, and ignored the waiting media and well-wishers. 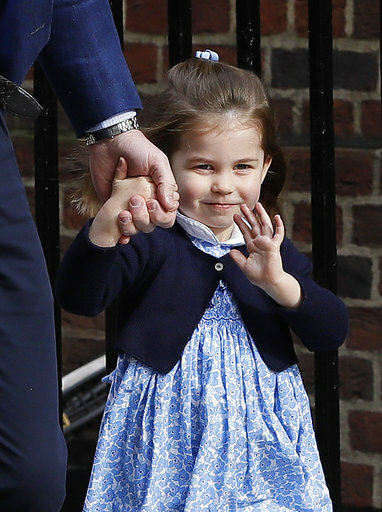 Charlotte, who is almost 3, gave the crowd a wave as the family entered the hospital's private Lindo Wing. 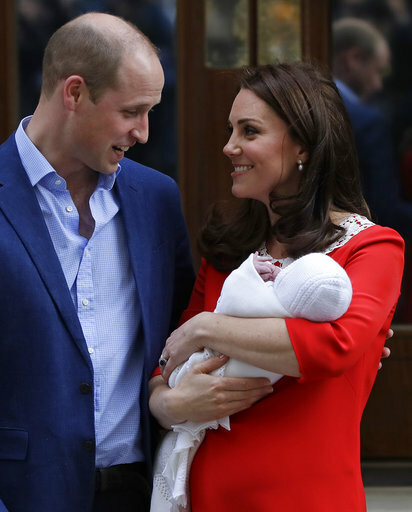 The Duchess of Cambridge gave birth to an 8-pound, 7-ounce (3.8 kilogram) baby boy on Monday morning. 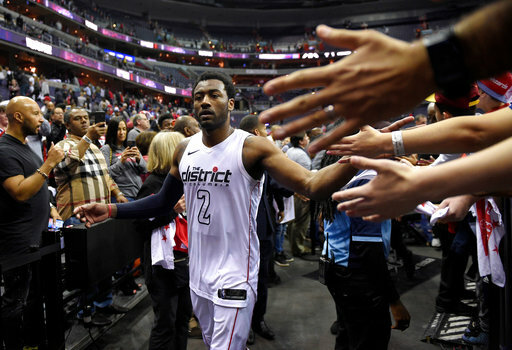 The new baby is fifth in line to the throne, behind his brother and sister. 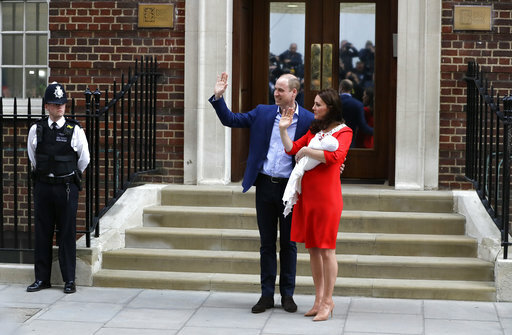 Prince William has left St. Mary's Hospital five hours after the birth of his third child, promising to return soon — likely with his older children in tow. 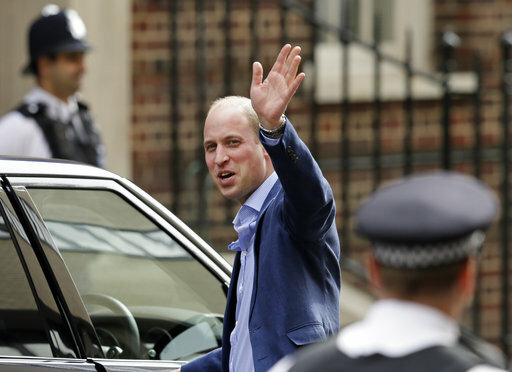 William said "back in a minute" as he emerged from the hospital just after 4 p.m. (1500 GMT; 11 a.m. EDT), waved at gathered media and well-wishers and drove off in a waiting Land Rover. 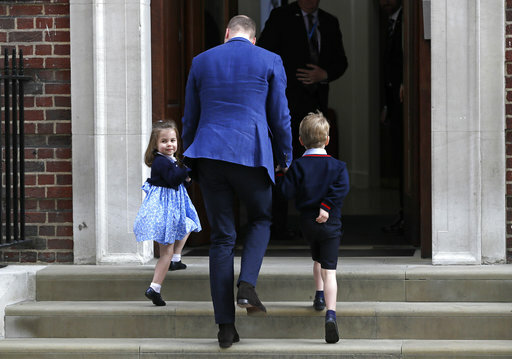 There's expectation he will bring 4-year-old Prince George and Princess Charlotte, who turns 3 next week, to meet their baby brother. 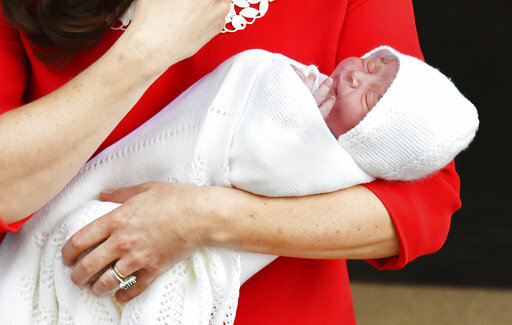 William's wife, the Duchess of Cambridge birth, gave birth to a son just after 11 a.m. (1000 GMT; 6 a.m. EDT) Monday. 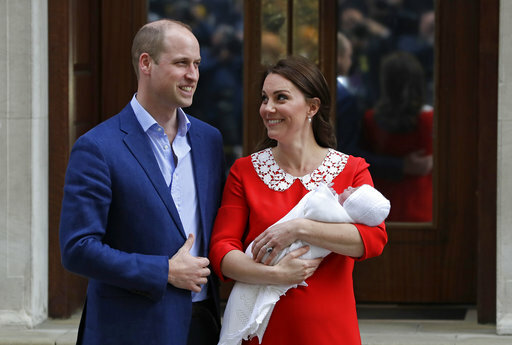 British Prime Minister Theresa May has offered "warmest congratulations" to Prince William and the Duchess of Cambridge on the birth of their new son. 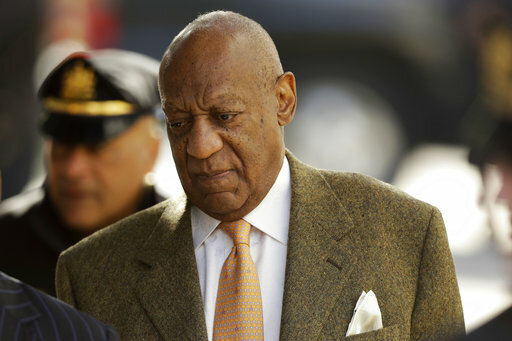 May says that "I wish them great happiness for the future." 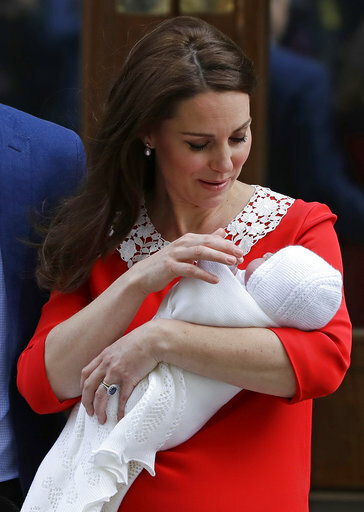 The couple's Kensington Palace office says Kate gave birth at 11:01 a.m. (1001 GMT; 6:01 a.m. EDT) to a boy weighing 8 pounds, 7 ounces (3.8 kilograms). The baby is the couple's third child and is fifth in line to the throne. 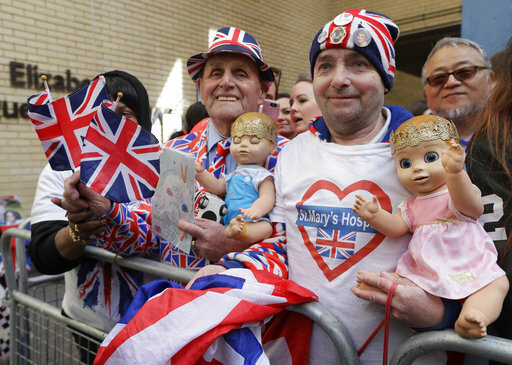 The news brought cheers from dedicated royal-watchers outside London's St. Mary's Hospital, where a self-appointed town crier proclaimed the birth. 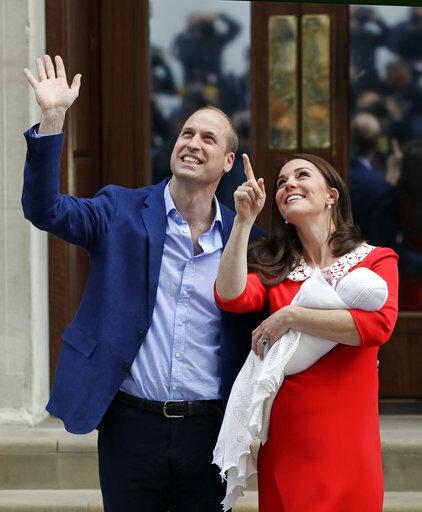 The words "it's a boy" were flashed in lights around the top of London's BT Tower, which can be seen for miles around. 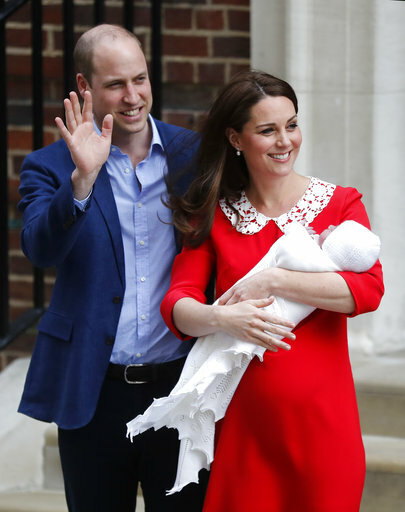 Kensington Palace says the Duchess of Cambridge has given birth to her third child, a boy weighing 8 pounds, 7 ounces (3.8 kilograms). 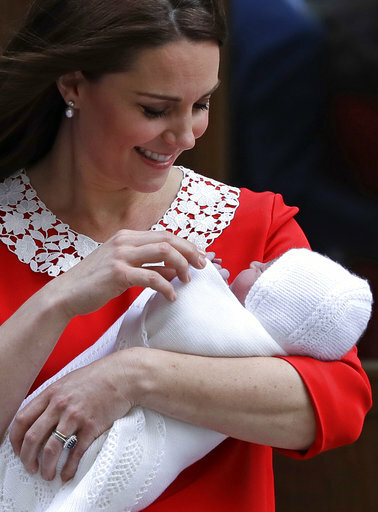 The palace says the child was born at 11:01 a.m. (1001 GMT; 6:01 a.m. EDT), a few hours after Kate was admitted to London's St. Mary's Hospital in labor.